TAMRA Alkyne, isomer 5 (5-Carboxytetramethylrhodamine propargylamide) is the orange-fluorescent probe that is compatible with various excitation sources including mercury arc, tungsten and xenon arc lamps, the 544 nm line of the Helium-Neon laser and the 532 nm green laser line. 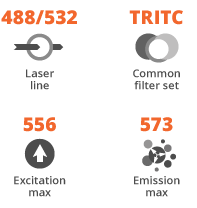 The absorbance and emission maxima of TAMRA conjugates are 553 nm and 575 nm respectively. The red-fluorescent TAMRA alkyne can be reacted with azides via a copper-catalyzed click reaction (CuAAC) to form a stable triazole linker. The click reaction between azide and alkyne is very efficient, requires no extreme temperatures or solvents and the reaction product is stable. In addition, the components of the reaction are bioinert; and perhaps most importantly, no side reactions occur – the label and detection tags react selectively and specifically with one another. A probe for copper-less detection (TAMRA DBCO) is also available for application where the presence of copper is not acceptable. TAMRA Alkyne, isomer 5 is structurally is identical to Invitrogen’s (Thermo Fisher Scientific) Tetramethylrhodamine (TAMRA) Alkyne (5-Carboxytetramethylrhodamine, Propargylamide), 5-isomer (Catalog number: T10183). An alkyne-activated, red-fluorescent probe used for detection azide-containing targets via CuAAC. 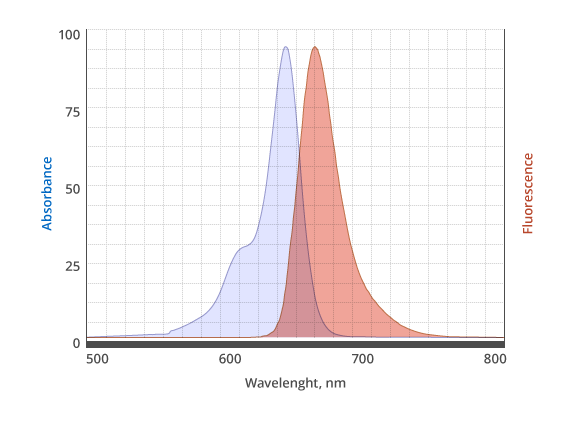 A bright and photostable, far-red-fluorescent probe used 633 nm or 647 nm laser lines.